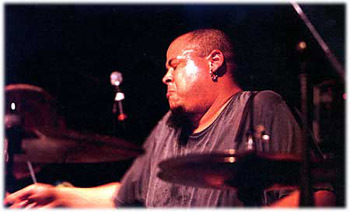 There are 50 live drum loops specially for this occasion, from Abe Laboriel, Jr. (pictured; Paul McCartney, Seal, Sting), Alex AcuÃƒÂ±a (Weather Report, Joni Mitchell, Whitney Houston), Billy Ward (B.B. King, Robbie Robertson, Joan Osborne), Gregg Bissonette (Santana, Joe Satriani, Steve Vai), John Ferraro (Steve Morse, Aaron Neville, Albert Lee), Bob Wilson (George Benson, Herbie Hancock, Boz Scaggs), and Eric Boseman (Liquid Grooves, Backbeat, Justo Almario). Raw AIFF/WAV, plus Apple Loops (for Logic and GarageBand) and SAGE loops for Stylus RMX. Habitat for Humanity is a really good and trustworthy charity, and hearing music instead of just getting a credit card receipt is a nice touch. Let us know about fundraisers if you hear about them and I’ll pass them along.